There’s cake onstage in Théâtre de la Ville’s Ionesco Suite, but it’s not there for eating. Much like the texts director Emmanuel Demarcy-Mota mashes together, the cake gets a face and hands shoved in, layers are manually rearranged, and the actors end up coated with it. It’s a fitting visual metaphor for the work of Eugène Ionesco, one of the fathers of the Theatre of the Absurd. Demarcy-Mota cobbles together a mood piece centered around three parties (a birthday, a wedding reception, and one that is difficult to pin down) using fragments from five of Ionesco’s plays. There’s little substance, but it’s a delight to experience – like cake. The birthday party is bleaker and more austere than the two that follow. Jauris Casanova plays a man-boy at the head of the table and his family present him with a series of eviscerating toasts, most notably a bravura monologue from Sarah Karbasnikoff as his mother. In sunglasses and a stylish jacket, she lambasts her son at great length right off the bat. The speech is funny because it’s so extreme, in keeping with the tenets of absurdism, and Karbasnikoff fully commits to the fury behind the text. In her believability, the humor is brought out. The first section gives way to the second and Karbasnikoff and Casanova become wife and husband celebrating their wedding. They soon get into an argument that flirts with violence, tearing into each other with words, fists, and cake. Both actors find a tone that walks between pure hatred and playful kidding. The performances enter that space where you’re in an argument with your partner and you realize what you’re saying isn’t as serious as it sounds, but then you overcompensate and become more serious so your partner listens to you – something hard to verbalize, something impossible to pinpoint until you see it. The other company members also have opportunities to shine. Charles-Roger Bour and Walter N’Guyen are detailed in their cross-dressed performances as grandmother and granddaughter in the first section, relying not on comedic broadness, but on finely shaded acting traits that go a long way to establish the position of these women in the family. Gérald Maillet brings a humorous edge to his fire inspector in the second section. Stéphane Krähenbühl becomes the focus of the third party and his eyes convey a mysterious world-weary dismay as the play draws to a close. Sandra Faure’s daffy, flop-footed, wild-haired performance is the comedic center of the play and when she appears with a great slash of red Batman’s Joker makeup across her mouth, it becomes clear – in Ionesco fashion – that there’s a sadness lurking under the laughs. The set and lighting design by Yves Collet create an intimate, austere setting that both supports and offers a juxtaposition to the antics that happen in it. The black void of the BAM Fisher presses against Collet’s white playing space, framing (trapping?) the players within it. The costumes by Fanny Brouste are attractive, solid-color party clothes that establish character and backstory that is not supplied by the fragments of texts employed. The production is often physical and, though the clothes seem rigid and formal, they allow great flexibility when need. They’re also cake-resistant. Four years ago, Théâtre de la Ville and many members of this company, brought their production of Pirandello’s Six Characters in Search of an Author to BAM. It was an extraordinary production of terror and humor and the spirit of the theatre. 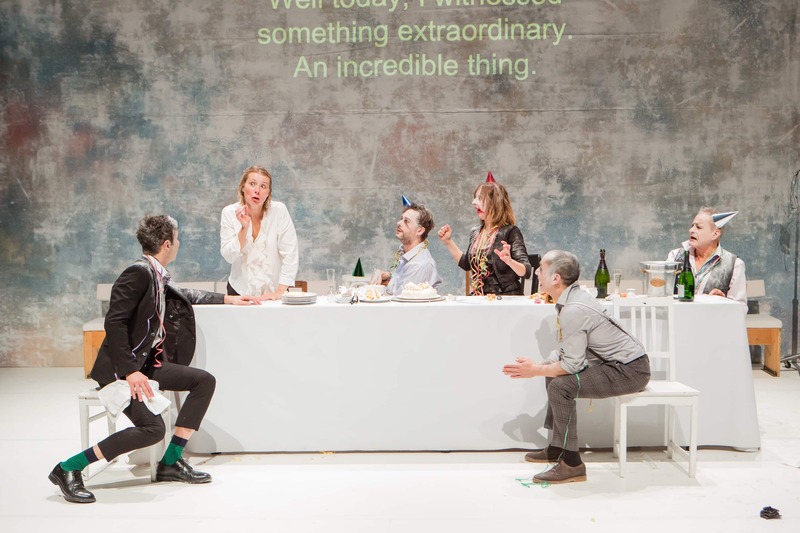 With Ionesco Suite, the Théâtre offers a looser, more company-devised production that also examines those themes, but narrows in on interpersonal relationships and the silly-awful things we say to each other. After the silence-your-cell-phones speech is delivered by a company member in a somber whisper, he places a pair of shoes in the aisle and they stay there, unaddressed. The shoes could mean a lot of things, but I think they represent Ionesco’s spirit, the unseen collaborator, watching this loving tribute to his work. Demarcy-Mota’s vision creates an ideal world for the text to thrive and the company functions like a well-oiled machine. They make it look, one might say, like a piece of cake.